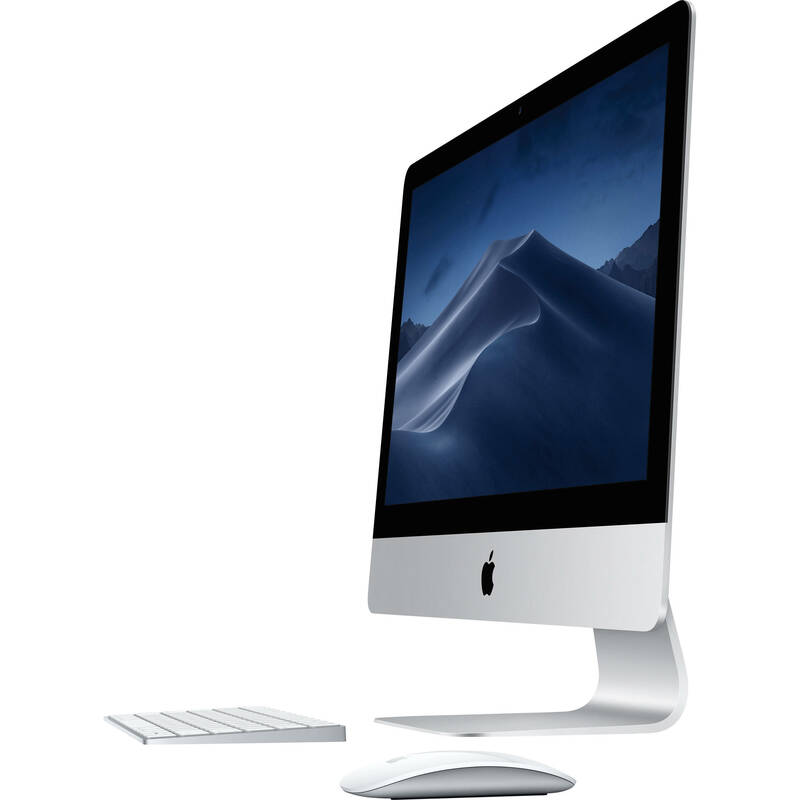 Apple weds high-res 4K visuals into its sleek 21.5" iMac with Retina 4K Display (Early 2019). In addition to its 4096 x 2304 screen resolution, its display offers 1 billion colors at 500 nits of brightness. The Retina 4K display also features the wider P3 color gamut, which provides a larger color space by utilizing red-green phosphor LEDs that uniformly represent red, green, and blue. And with more available colors, images will appear more vivid and reveal greater detail, with more balance and precision. The iMac's processing power has been upgraded with an 8th-gen 3.2 GHz Intel Core i7 6-Core processor as well as 8GB of DDR4 RAM. Graphics are powered by a dedicated AMD Radeon Pro 555X graphics card, and for storage, there it's equipped with a 1TB 5400 rpm HDD. Outfitted with Wi-Fi 5 (802.11ac) and a Gigabit Ethernet jack, this iMac can connect to both wireless and wired networks. Other integrated features include Bluetooth 4.2, an SDXC card slot, two 40 Gb/s Thunderbolt 3 ports, four 5 Gb/s USB 3.0 Type-A ports, and a FaceTime HD camera. It also has a Kensington lock slot for added security. Apple's 21.5" iMac with Retina 4K Display (Early 2019) operates on 100-240 VAC at 50-60 Hz and includes an Apple Magic Keyboard, an Apple Magic Mouse 2, a Lightning to USB cable, and a power cord. Protection is covered with 90-days of complimentary technical support and a limited 1-year warranty, which can be extended by purchasing AppleCare+ for Mac. This Mac comes preloaded with macOS. Updates can be downloaded for free via the Mac App Store. Please check Apple's website for upgrade eligibility. Available with a 4K resolution of 4096 x 2304, the Retina display shines beautifully on iMac. With one billion colors and 500 nits of brightness, graphics, text, television shows, and movies are sharp and lifelike, while games also display fine details. The world is full of color, and iMac brings more of them to your screen. The Retina display uses P3 color that shifts away from standard white LEDs to advanced red-green phosphor LEDs. That means all three colors - red, green, and blue - are more equally represented and show off real-world color with more balance and precision, bringing all your photos and content to life more vividly. This iMac is equipped with an 8th-gen 3.2 GHz Intel Core i7 6-Core processor and an AMD Radeon Pro 8 graphics card. Storage moves along quickly too, with a 1TB 5400 rpm HDD, so no matter what you're into, you can get it done on your Mac. MacOS is the operating system that powers everything you do on a Mac. It lets you do things you simply can't with other computers. That's because it's designed specifically for the hardware it runs on - and vice versa. macOS has features inspired by its most powerful users but designed for everyone. Your iMac works seamlessly with your iPhone. Whether you're texting, snapping a photo, or copying and pasting an image, you can move between devices without missing a beat. Powerful creativity and productivity tools live inside every Mac. These apps will help you explore, connect, and work more efficiently. They include Safari, Photos, Mail, Siri, Calendar, Pages, Numbers, Keynote, News, Messages, FaceTime, and Notes. iMac has always stood out in form and function. It is an elegant, quiet, all-in-one computer that puts everything - display, processor, graphics, storage, memory, and more - inside one simple, stylish enclosure. And thanks to its super-slim profile, which measures 5mm at its edge, it fits in almost anywhere, yet stands out everywhere. Two Thunderbolt 3 (USB Type-C) ports come standard on the iMac, each delivering data transfer speeds of up to 40 Gb/s for external drives and cameras, as well as ample bandwidth for video and display connectivity. Four 5 Gb/s USB 3.0 Type-A ports give you plenty of options for connecting peripherals, including your printer, iPhone, thumb drive, and more. And with fast three-stream Wi‑Fi and Bluetooth 4.2 wireless technology, you're instantly connected to all your favorite content. Thunderbolt 3 lets you add one 5K display alongside your iMac. Or, you can connect two 4K displays and put over 32 million pixels into play. Magic Mouse 2 and Magic Keyboard pair with iMac and come included in the box. If you're looking for extra functionality, Magic Keyboard with Numeric Keypad and Magic Trackpad 2 are sold separately and offer some additional options.